ACE’s 2019 Annual Fiber Arts and Jewelry Exhibit challenged local artists to use images from recent Vogue magazines as a springboard to create new works. Each artist selected a unique page from Vogue – an advertisement or photo spread – interpreting its colors, textures, and styles through the lens of their chosen medium. The resulting pieces vary widely in their similarity to the original image. Viewers will have a chance to compare the two, as the Vogue image and the finished piece will be displayed side-by-side. When Art Center East approached the Quilt Shop about partnering for the exhibit, Anderson instantly thought of the Vogue idea as something to build the show around. 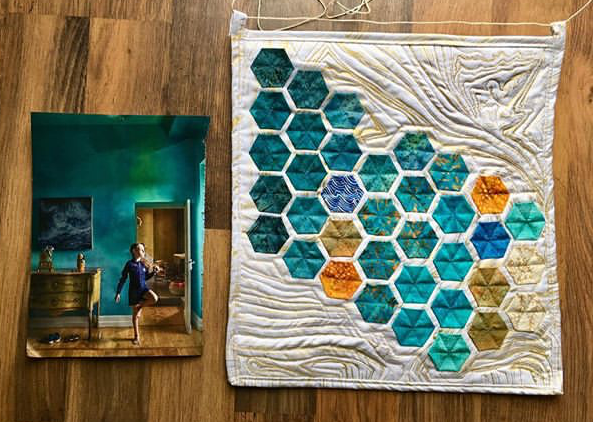 Art Center East hosts an annual fiber arts exhibit in order to create a platform for this underrepresented branch of the visual arts, and to showcase local fiber artists. Fiber Goes Vogue will be on display February 1 – March 29. The public is invited to attend the opening reception on Friday, February 1 from 6-8pm. All Art Center East exhibits and receptions are free admission.